Sea Shells, Take Them or Leave Them? Bohol can pride itself in the interest of many biologists who specialize in the study of shells, as Bohol is one of the most richest habitats of sea shells. With an unparalled number of species, many of them unique to Bohol. Also, as a tourist on Alona beach, or any other beach on the island, you will not be able to escape the many wonderful sea shells being offered for sale by lady vendors, carrying their wares in winnows on their head, or in small stalls along the beach. The one even more beautiful than the other, making it difficult to decide which ones to bring home as a souvenir. However, the shells these vendors offer are the outside skeleton of living creatures, and, when you have the change to see them alive, they are often even much more beautiful than dead. Especially cowrie shells look wonderful. Most of the shells offered have not been washed ashore, but have been caught alive for the purpose of selling them to tourists. If you wake up early in the morning, and stroll along the beach at low tide, especially at spring low tide, you can see numerous people collecting these shells on the beach and between the rocks near the beach. To them, the 10 or 20 pesos you pay for a shell is good money, and needed to make a living. All of these shells, however, are part of the underwater biotope, and play a vital role in it. Taking them away irresponsibly can cause irrepairably harm the coral reefs. One of the most beautiful shells of all, and a collector's favourite, is the large triton's trumpet (Charonia tritonis), which can still be bought at a few places along the beach, although it's price is getting higher by the year. A large one can easily fetch over 2000 pesos -- more than a month's salary for many Boholano's -- The reason that it gets so expensive is that it is really getting scarce. The triton's trumpet is a protected species in the Philippines, and the law calls for some stiff penalties for the possession or trade in this species, but this law is not really enforced, given the fact that it is openly offered for sale. Still, there are much better reasons to avoid buying them. The triton's trumpet is a predator. It lives on mollusks, echinoderms, and worms. It is fascinating to see a triton's trumpet attack its prey. When they sense the presence of a prey, literally by smelling it underwater, it extends from its shell and rushes towards its victim at an unexpected speed. It then uses its foot to seize the prey, and secretes a strong paralyzing acid and starts to digest it. Tritons can become very old and, in their old age their shells can reach sizes up to 50 centimeters long. Triton's trumpet is also very important to maintain the biological equilibrium of the tropical coral reef. The triton is one of the few natural enemies of the crown-of-thorns starfish (Acanthaster planci). This creature is a many legged starfish, covered with sharp toxic spines; you will have to handle them with extreme caution. This starfish lives on the coral polyps, and a group of them can consume an entire coral colony in a matter of hours. Leaving behind nothing but the bleached white skeletons. At times, the crown-of-thorns starfish become a plague, and entire reefs are destroyed. 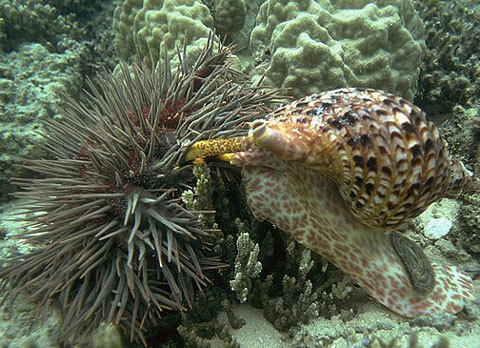 Photo by Richard Chesher, Ph.D.
A triton's trumpet attacking a crown-of-thorns starfish, and thus saving the coral reef from one of its most notorious pests. This photograph is taken in Australia, and is courtesy of Tellus Consultants. Although scientific opinions differ, one of the causes of these plagues is considered to be the near-extinction of the triton's trumpet. Without its predator, the starfish can multiply unrestrained, and do its destructive work. Concluding, you will do the coral reefs a favor if you leave these shells in the shop, and help your little bit in protecting the coral reefs. Oh, yes, by the way, the shells you buy in one place do not necessarily come from that place. Shells are actually transported all over the Indo-pacific, and you may even buy shells from that nice local lady, brought all the way from Zamboanga or even Indonesia. It would be best if the little booths on the beach will start selling posters of these marvelous creatures, instead of their skeletons, so you can admire them without killing them. And if you really want to collect shells, why not search out a more remote beach - Bohol has plenty of these -, and pick up the ones washed ashore. If you happen to get one with a hermit crab inside, don't kill it, but look for another empty shell for the animal, place them together in a bucket for some time, and maybe it is willing to change shells. A facinating sight, by the way, to see it quickly move its weak back part from one to another shell. Very nice, but difficult to obtain and very expensive is Shells of the Philippines by F.J. Springsteen and F.M. Leobrera. Published by the Carvel Seashell Museum in Manila in 1987. This book is one of the most exhaustive guides to shells in the Philippines, and contains 100 coloured plates with almost 2000 pictures. Unfortunately, however, this book still mostly aimes at the collector of shells, and doesn't show the full beauty of life shells in their natural environment. While visiting Bohol a few weeks ago, we bought some shells from one of the many peddlers on the catamaran tour. As we were leaving for the States, my wife was stopped at the airport screening and was told that she had to take the shells out of her luggage and turn them in to the quarantine/ conservancy desk. They aren't allowed to leave the Country apparently. We only paid a few.pesos for them so it was no big loss. Wish we knew beforehand though. I am an artist from Manila and I would like to share with photos of my paintings- acrylic paintings on canvas that features Philippine seashells, real and authentic seashells incorporated into the paintings and painted with acrylic paints. I would like to invite you to visit my website for sample photos of my works. I have done three solo shows in Manila and in New York City. Please visit www.titoestrada.com. Nice. It would be great if you could add some bigger reproductions of your work on your site.--Jeroen. Read all 27 comments by readers. your comments on "Sea Shells, Take Them or Leave Them?"